H. K. Onnes, Commun. Phys. Lab.12,120, (1911) Mercury was historically the first to show superconductivity, and it is an example of a Type I superconductor. Its practical usefulness is limited by the fact that its critical magnetic field is only 0.019 T, so the amount of electric current it can carry is also limited. The superconducting transition of niobium-tin was observed by measuring the inductance of a coil which was wrapped around the sample. 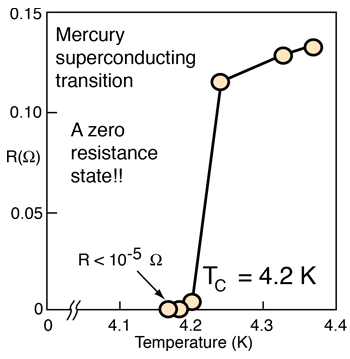 At the superconducting transition, the magnetic field is expelled by the Meissner effect and the inductance drops. This measurement was made by immersing the coil in liquid hydrogen and measuring the inductance as a function of temperature. Bednorz and Muller, Z. Physik B64, 189, (1986) This ceramic material was the first of a new class of high temperature superconductors. It is made by randomly substituting some barium atoms into the lattice of lanthanum- copper-oxide in what is termed a solid solution. This ceramic material was the first of the high temperature superconductors to make the phase change at a temperature above the liquid nitrogen temperature (77 K). This disc of YBaCuO certainly doesn't look or feel like an electrical conductor. It is a hard, brittle ceramic material. It looks like something you would make a grinding wheel out of - the fact that it can become a perfect conductor is hard to believe. 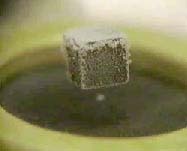 But when a small rare-earth magnet is placed on it and liquid nitrogen is poured around it, the magnet levitates, showing the Meissner effect characteristic of the zero-resistance state. 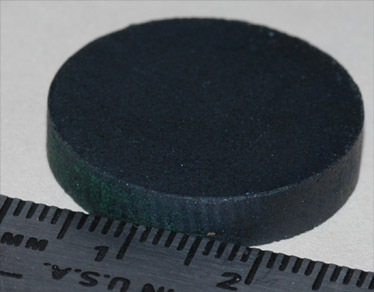 In the illustration, the black YBaCuO disc is held in a brass mount to facilitate cooling and holding it at liquid nitrogen temperature.